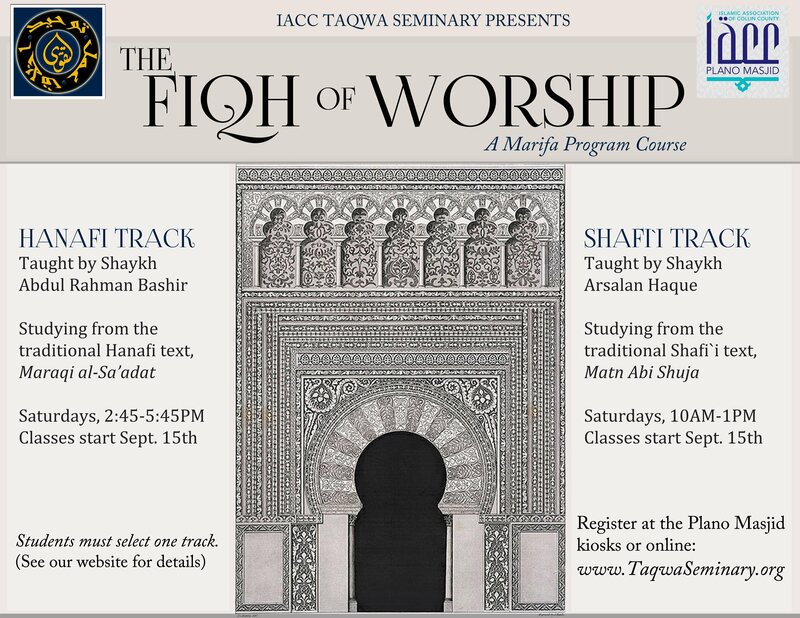 This course offers two parallel tracks in Ḥanafī and Shāfiʿī jurisprudence. Students will learn the legal rulings pertaining to purification, prayer, fasting, charity and pilgrimage based on a classical primer in the their respective madhhab. b. the fiqh of the school of Imām Abū Ḥanīfa or Imām Shāfiʿī in particular. b. the meticulousness of our scholars. b. the need for learning. Textbook: Shurunbulali, Abu ‘l Ikhlas, Marāqi al-Saʿādāt: Ascent to Felicity. White Thread Press. Textbook: Furber, Musa, The Accessible Conspectus. Islamosaic. Must have completed or co-enrolled in MRF 101 and FQH 101. For students who missed the live courses, they are now available online.